I see quite a few recipes online for various ways to make the best pulled pork. These posts are usually followed by a slow cooker recipe or some kind of dutch oven braising technique and so forth. I understand that in today’s society, convenience is a factor. You get home from work and you either want to throw something together quickly or retrieve it from the slow cooker and place it on the table. If that’s what you’re after, you’ll have to keep on looking. 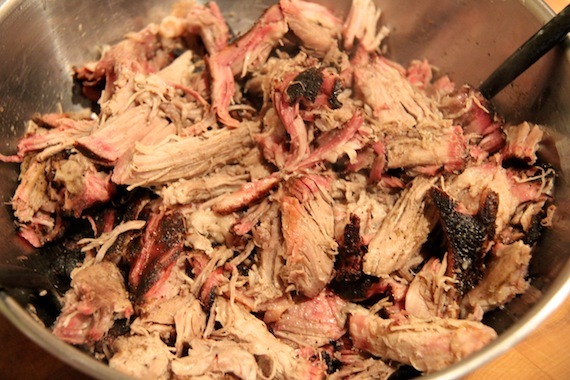 This recipe is about slow smoked, authentic barbecue. This method may not be convenient, but there is something to be said for hanging around the house, doing a few chores, throwing back a few brews, and enjoying the day while anticipating that tasty hunk of pork which is smoking and tenderafying (yes, of course that’s a word) in the ol’ barbecue pit. A pit type barbecue is necessary for this recipe. They are very useful and not that expensive. They usually consist of an off-set firebox, a smoke chamber and a chimney. Simple. As you can see from the photo above, mine gets plenty of use. Salmon, Chicken, Beef, Pork and just about every one of God’s creatures I can get my hands on, may end up in the barbecue pit (I’m talking to you hungry deer in my veggie garden!). For this recipe, we start off with your favorite spice rub. I use a simple one which can be found here. Start up the barbecue and, using a good smoking wood such as most fruit or nut wood, mesquite, hickory, oak, etc.. get the fire going steady. It is important to establish a good bed of coals. Then, coat all sides of the pork shoulder with the rub and place the meat in the pit. You should aim for around 250-300 degrees in the pit. Don’t keep opening the door and letting the heat out! 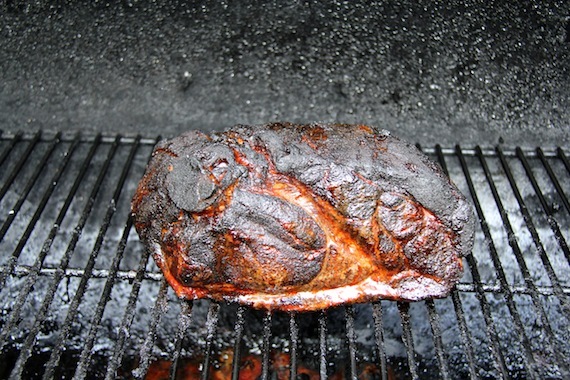 You should smoke the pork shoulder for about 6 hours to embed a good smoky flavor. At this point, I like to wrap mine in foil and finish in the oven at 350 degrees for about 2 hours. Internal temp of the meat needs to be about 200 for it to be shreddable. Once out of the oven, the bone should easily pull from the meat. Then you know it is time to shred. Move meat to a bowl or roaster, and, using two opposing forks start shredding the meat. I like to keep the chunks fairly large and substantial. 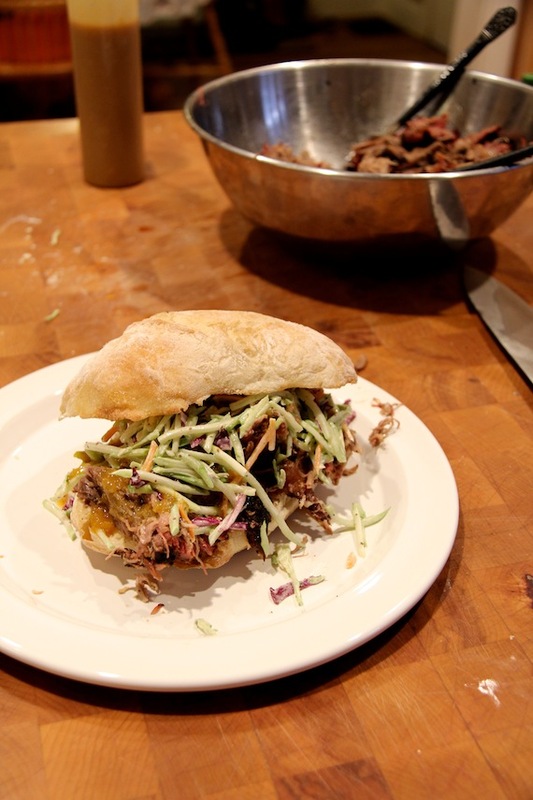 Serve pulled pork with buns, lettuce, pickles, onions, jalapenos, and any other condiments you prefer. I also like to serve mine with coleslaw on top. The image below was taken using broccoli slaw which turned out fantastic. Additionally, I like to make a homemade mustard BBQ sauce to accompany. Enjoy! Ron, how long will this rub keep? I would expect it to keep for several months. Brown sugar may make it clumpy… but could be left out and added before use.